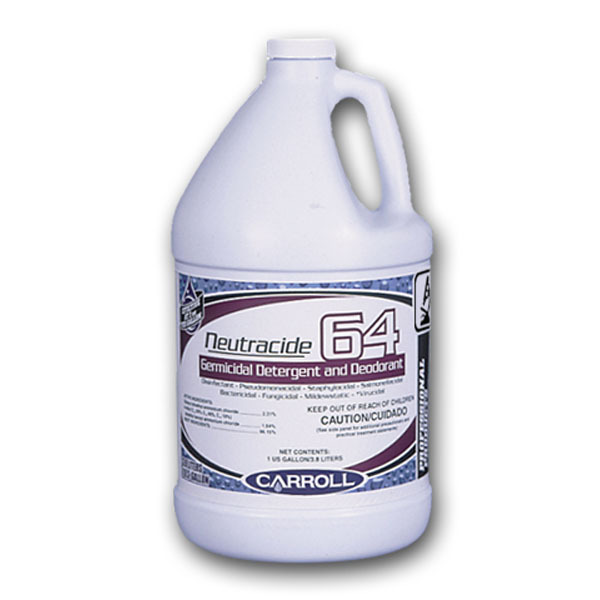 A concentrated, neutral pH, multi-purpose, germicidal detergent and deodorant for use on hard non porous surfacesÂ such as floors, walls, metal surfaces, stainless steel, porcelain, and plastic. Ideal for use in hospitals, nursing homes,Â schools, colleges, and many other facilities.Â Its pleasant fragrance combats foul odors in the air while the disinfectant works to destroy odor causing bacteria atÂ their source. In addition, the neutral pH is ideal for use on finished floors. The quat-based formula is effective againstÂ the pathogenic bacteria Pseudomonas aeruginosa, Staphylococcus aureus, and Salmonella choleraesuis in theÂ presence of 400ppm synthetic hard water (calculated as CaCO ) plus 5% organic serum. Effective against many other 3Â species as well. Virucidal against HIV-1 (AIDS Virus) and many other viruses; fungicidal and mildewstatic at use dilutionÂ when used in accordance with label directions. Please refer to "Efficacy Data" on the back of this sheet for a completeÂ listing.